As hard as it is to believe with games like Call of Duty and movies like Pearl Harbor, World War II is the single most terrible thing to have ever happened in human history. Of course, most of us are taught in US history courses that we were the good guys, and bombing Japan was exactly the lesson they needed to know their place. For that reason, I think it is important for Americans to see a Japanese perspective of the war. 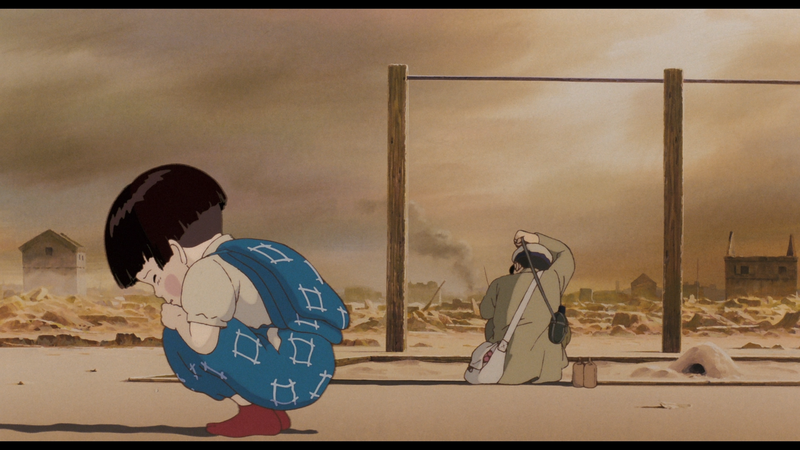 Takahata Isao’s Grave of the Fireflies (火垂るの墓 Hotaru no Haka) takes place as the war is winding down. By the war winding down, I mean the US had captured islands close enough to Japan to launch bombing campaigns on Japan itself. Seita, the young son of a Japanese naval officer, and his sister Setsuko just barely escaped a US napalm raid with their lives. They soon realize it is up to them to eke out an existence amidst the insanity where many Japanese people still felt it was their duty to support the Japanese war effort. Grave of the Fireflies is, quite simply, unlike any war movie I have ever seen before. It is told entirely from the perspective of Japanese children. Despite that, they very much wound up on the frontline. Takahata demonstrated pure genius in his construction of his lead characters, particularly Setsuko. Setsuko is completely unable to comprehend the suffering she has to endure. She has to trust Seita to take care of her. In the meantime, Seita has his hopes that his father can keep the United States at bay. In the meantime, every civilian of Japan has gone into survival mode. Most are unwilling or unable to help those in need. Just about everyone, including Seita, has become desensitized to seeing dead bodies in places like a train station or a beach. The scene that remains burned in my mind is that of Setsuko constructing the titular grave of the fireflies and when she revealed to Seita that she knew of the fate of their mother. I have never bawled as hard at a movie, animated or otherwise, as I had with that scene. I think for that scene alone, Grave of the Fireflies easily wins its place as one of the greatest animated films of all time. It’s a shame that Takahata will forever be in Miyazaki Hayao’s shadow as Studio Ghibli’s unsung hero. Grave of the Fireflies is quite simply the best anime film I have ever seen, and could very well be the best Asian film I have ever seen in general. Even though the movie is now 24 going on 25 years old, it has improved with age if anything. It was a tearjerker that did not at all resort to being manipulative like many modern American dramas do (I’m looking at you, Precious). If I could give this movie a score higher than 4 out of 4, I would with no hesitation. Grave of the Fireflies is a movie everyone needs to see with their hearts wide open. Sweet jesus christ, yes! Best animated movie of all time! Along with Finding Nemo, Spirited Away, Mononoke-Hime, to name a few. But the one that really made me bawl so hard was when Setsuko, my beloved Setsuko, was already malnourished and hallucinating and mistaking the marbles for her favorite gum drops. Oh dear God that got me rolling in the floor bawling. I love this movie. I don’t think I can watch it again.